Auto Motor und Sport Magazine is a specialist automotive magazine published in Germany. It is one of the leading automobile magazines in Germany which is published on a fortnightly basis. Buy a single copy or subscription to Auto Motor und Sport magazine. The magazine was created by two racing car drivers, Paul Pietsch and Ernst Troeltsch and Joeef Hummel, a businessman. The publication has been in existence since 1946. From an interesting standpoint, the earliest Auto Motor und Sport Magazine is credited with running stories on the future use of nuclear power stating that motor vehicles were likely to continue to run on oil based fuels as atomic fuel would be too expensive. The current magazine provides information on classic German cars, highlights of auto shows, reviews of new German cars, and information on buying a car. Article in a recent issue included an article on the new VW Golf which will be launched in November 2012. The car is expected to generate high interest with sales of 616,000 cars in the first year on a worldwide basis. By 2016, sales of the new Golf are expected to reach million cars. 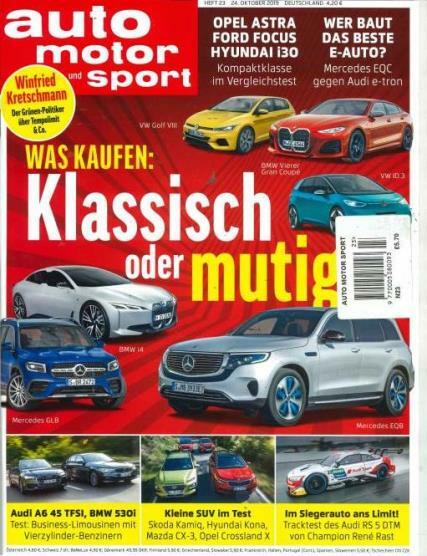 If you are interested in German cars, both classic and contemporary, you want to read reviews of new cars, get information on prototypes, new car design, and the results of road tests you will want a subscription to Auto Motor und Sport.